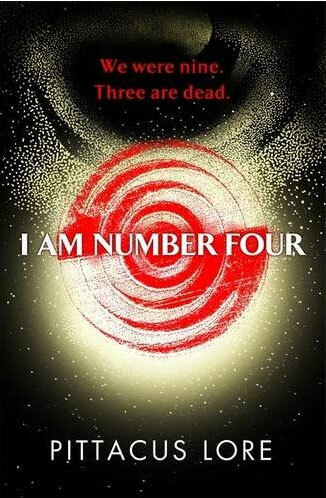 First in the Lorien Legacies series by Pittacus Lore. I am Number Four is a science fiction novel, in which the main character, John Smith, is an alien from his home planet Lorien, and he came to Earth with eight others. On Earth, John is protected by his Guardian, Henri, and is developing his legacies, which are things like extra strength, telekinesis, and speed and agility. The Mogadorians, another race of aliens, learn about the nine children and come to Earth to try and kill them. The Loriens can only be killed in number order, numbers 1 to 9. The first three have already been killed, and John is Number 4, so the Mogadorians are after John next. When John and Henri learn this, they move away from Florida to Paradise, Ohio, where John befriends Sam Goode, a boy who believes in aliens, and a dog who he names ‘Bernie Kosar’. John also falls for Sarah Hart, whose ex-boyfriend football player, Mark, is a bully who torments both Sam and John. During the Halloween festival, Mark and his friends chase John and Sarah into the woods, with the intention of beating John up. John uses his legacies to fight them and save Sarah. Sam sees this, and John is forced to reveal his true identity to him. Eventually, Henri says that people are becoming too suspicious of John so they have to leave. John refuses because of Sarah. But what happens when the Mogadorians figure out where John is hiding? I found this book okay, but just okay- it’s not great. I didn’t really enjoy it. It’s good for ages 11-ish, give or take a year. The movie for I am Number Four is out.